MEDIUM: This print is an unframed, unmatted photographic print. SIZE: Choose a size from the drop down menu under "Select Options" on the right. 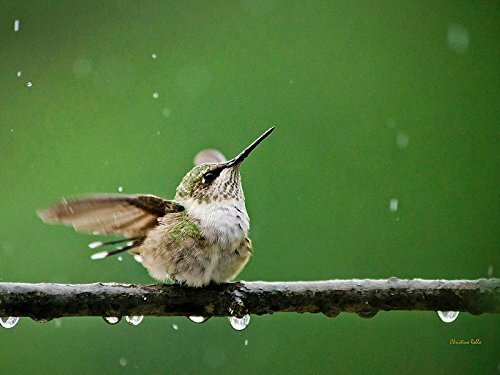 DESCRIPTION: Ruby Throated Hummingbird perched on a branch in the rain. Fine art photography print, professional grade photo paper, standard photographic finish, archival quality. CROPPING: Photos will appear slightly different depending upon size ordered. Photos displayed in my shop are 4:3 (rectangle) or 1:1 (square) ratio. If an adjustment is needed, the photo edges will be cropped around the main subject to fit the print size you order. If you're concerned about the loss of certain details, please contact me to see a sample crop before you order. I do not accept returns due to cropping. If you have any questions about this product by Christina Rollo, contact us by completing and submitting the form below. If you are looking for a specif part number, please include it with your message. © 2019 - holdupart.com. All Rights Reserved.